$25 adults; 15 students 5-18; Under 5 free. The Napa Valley Youth Symphony, under the direction of Tristan Arnold, presents a concert of more than 100 young musicians from Napa and Sonoma Counties. High School Senior violinist Justin Row will perform the first movement of Édouard Lalo’s lustrous and exotic showpiece Symphonie Espagnole. High school sophomore Gabrielle Cortez will perform the epic final movement of Camille Saint-Säens’ Third Violin Concerto. Cellists Jasmin Cruz and Elena Pang will perform the first movement of Vivaldi's Concerto for Two Cellos. 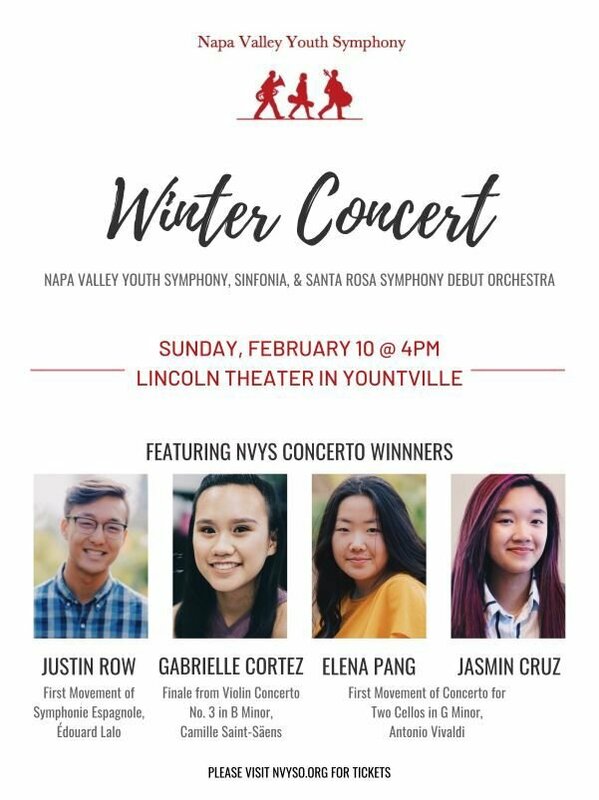 NVYS Sinfonia, The Youth Symphony’s training ensemble, will open the concert with their Sonoma County counterpart: The Santa Rosa Symphony’s Debut Youth Orchestra under the direction of Alan Aníbal. This annual celebration of youthful music making is sure to inspire. Sunday, February 10, 4 pm at the Lincoln Theater, Yountville. Please visit nvyso.org for tickets.